There's a high social cost that comes with lighting up. The home improvement company Porch recently polled 1,009 people on their feelings about smoking. The company recently published the results as infographics. Cigarette smoking has had a bad name since the first Surgeon General's warnings in the 1960s, and a lot of erstwhile buttheads consider themselves more health-conscious by smoking cigars instead. Tobacco smoke, though, regardless of its source, contains dangerous toxins that pose a danger to others via their exposure to secondhand smoke. Thirdhand exposure is also an issue, from contact with clothing and surfaces on which smoke lands. Though marijuana is generally believed to be safer than tobacco — and to have medicinal value — that's not entirely certain yet. Vaping with tobacco or grass also exposes the vaper to toxins. The home improvement company Porch recently polled 1,009 people — 570 men and 490 women — on their feelings about smoking, especially cigarette smoking. The recently published the results as infographics. When it comes to good-old tobacco smoking, it's a habit that requires a serious commitment of cash, not to mention health. The average smoker spends $96.22 per month for the privilege of lighting up 8.9 times a day. And that's without the local cigarette taxes imposed in some areas as a disincentive for the habit. If that seems like a lot of scratch, Porch found smokers would be willing to spend even more if certain perks were included. 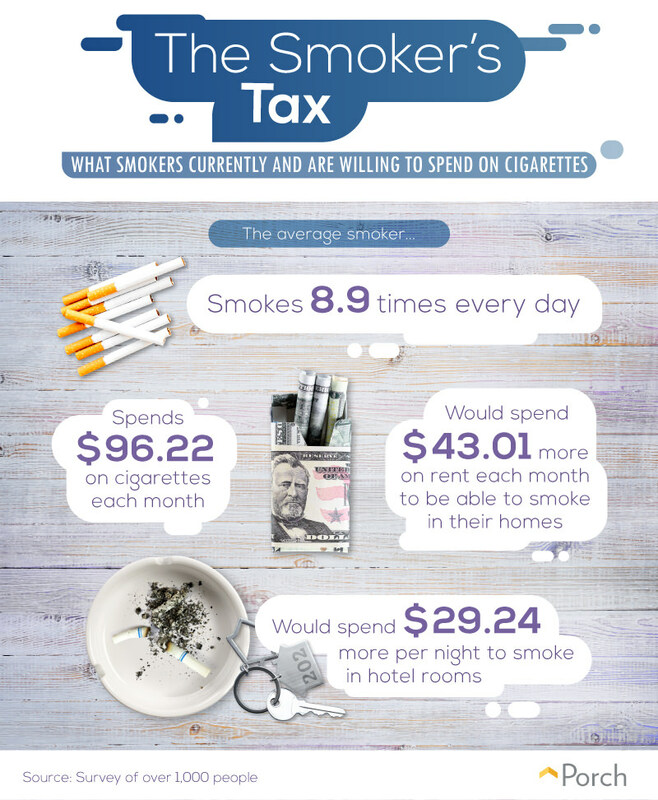 They'd pony up another $43.01 to smoke in their homes without getting any flack — not sure who exactly they'd be paying — and tack on another $29.24 per night to hotel bills to be able to smoke in their rooms. Smokers, nonsmokers and reformed smokers have feelings about hooking up with smokers. While about 80 percent of nonsmokers find the habit a turnoff, the remainder wouldn't necessarily spurn a smoker's attention. Ex-smokers are iffy, perhaps for fear of backsliding. A little over a third of the male ex-smokers polled said maybe, while only 19.8 percent of women would be okay with dating a puffer. 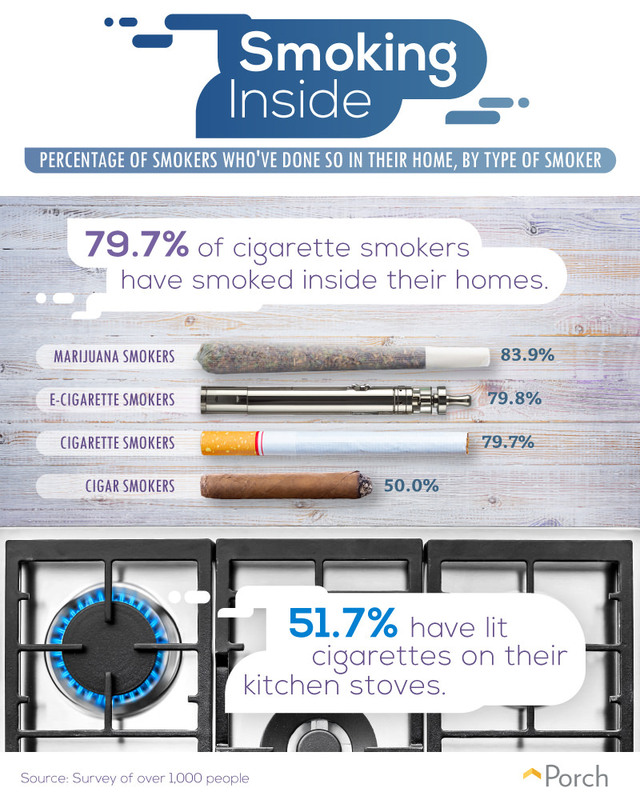 At the bottom right below sits the most icky pie chart we've seen in a while, and appropriately so: that ashtray reveals that 19.2 percent of nonsmokers would rather date a convicted felon! Porch throws in an extra amusing political tidbit here: A majority of both parties would rather go out with a member of the opposing party than someone with a nicotine habit. Three out of four nonsmokers won't put a deposit down on a house whose smell reveals that a smoker was a previous inhabitant. Likewise, remember how smokers would pay extra to be able to smoke in their hotel rooms? Well, nonsmokers staying at those spaces would not be too happy about that. Almost 90 percent of nonsmokers would demand a room switch if their temporary abode smelled like smoke. 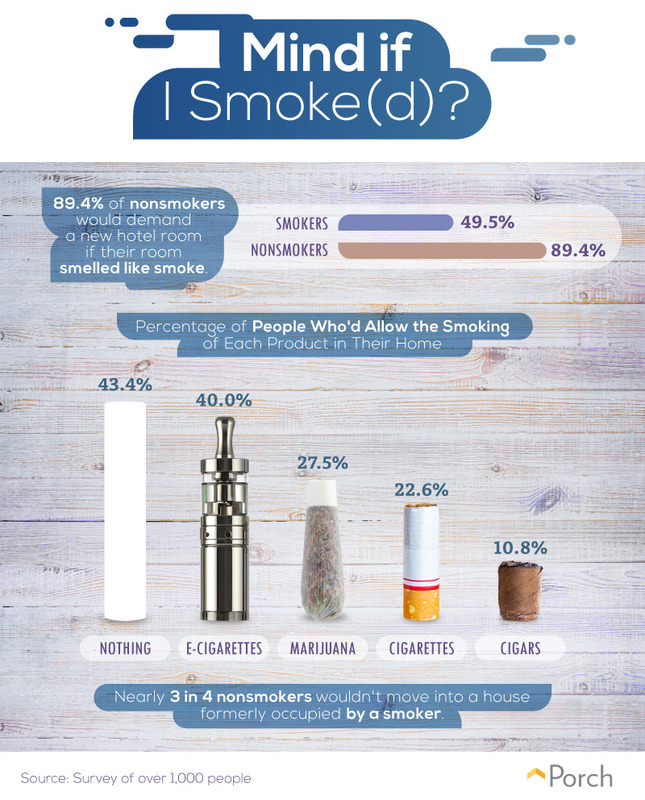 But let's say you're a nonsmoker and you've moved in and have company over: about 43 percent of you don't want guests smoking anything in Chez Vous. Vaping would be sort of okay, getting high a little less, and 22.6 percent of nonsmokers would find themselves having to awkwardly request their guests put those death sticks away. Of course, famously stinky cigars are the least welcome of all. Almost 80 percent of smokers light up in their own domiciles. Question: Is lighting a cigarette on the stove cool or ridiculous? Discuss. How about lighting a match on your teeth (not part of the survey). Pot smokers are even more likely to smoke at home, which makes sense considering that herbally recreating in public may pose problems, and in some places arrest. Once again, cigar smokers, presumably many of whom live with people who have noses, only smoke at home about half the time. 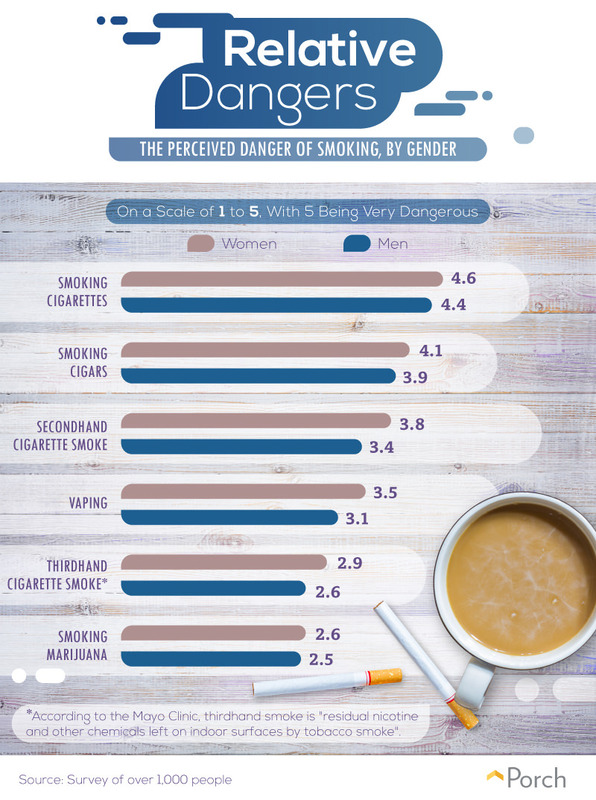 In general, women consider all forms of smoking slightly more dangerous than men do. Beyond that, the survey's respondents have the relative dangers in about the right order according to current research. However, it's likely we have more to learn about thirdhand-cigarette smoke, marijuana, and vaping various varieties of plant matter. So playing the odds with one's own health is one thing, but what about rolling the dice with the well-being of the children who happen to be around when you smoke coffin nails? 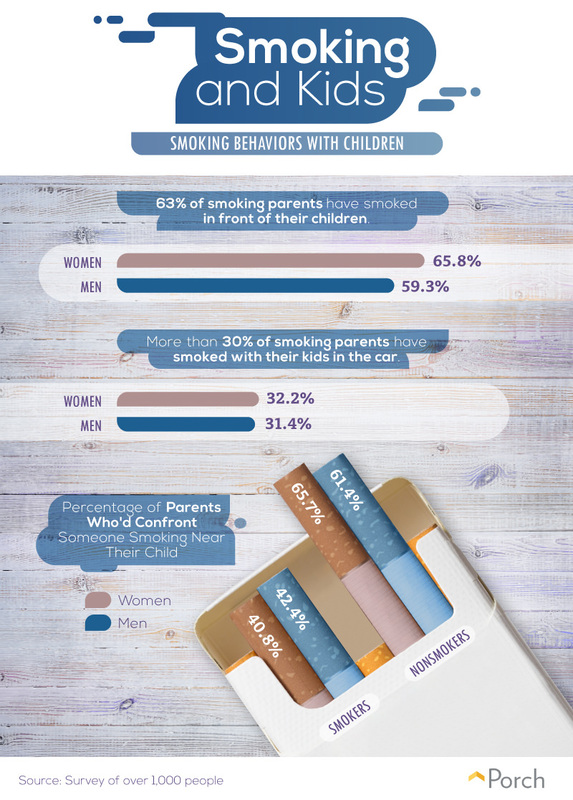 About two thirds of nonsmoking parents would speak up if you tried it, and about 40 percent of smoking parents. Of those smoking parents, about two thirds do smoke around their own children, and a third of them in the car — obviously, that's close exposure, and when the weather is such that the windows are closed, a car is nasty place for a kid who wants to breathe. Smoking is something that just doesn't seem to ever want to go away, and that's been true since ever the early colonists were exposed to tobacco by the locals. Each generation has its own relationship to it, finding it alternately fashionable/cool or repulsive/unhealthy — smoking is currently on the decline. But for many, the oral appeal is undeniable. If you're a smoker, we'd of course like you to be around as long as possible, and hope you'll consider quitting — there are lots of ways to making it happen once you can cough up sufficient determination.